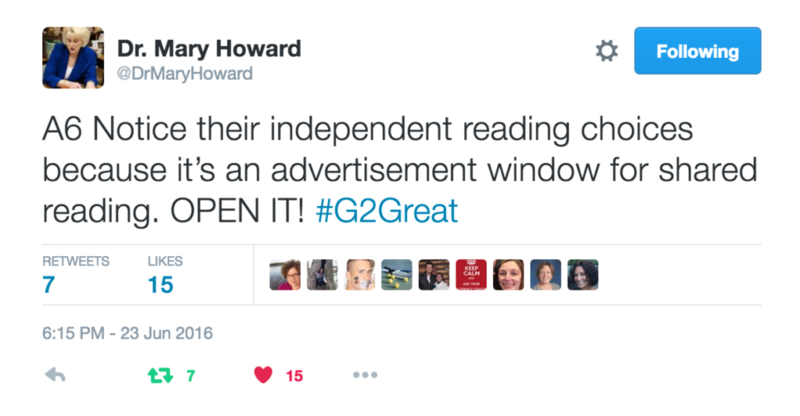 In other words, next generation read-aloud asks us open the read-aloud door wider as we invite students to engage in meaningful opportunities to do this productive and joyful work within and beyond the read-aloud experience. 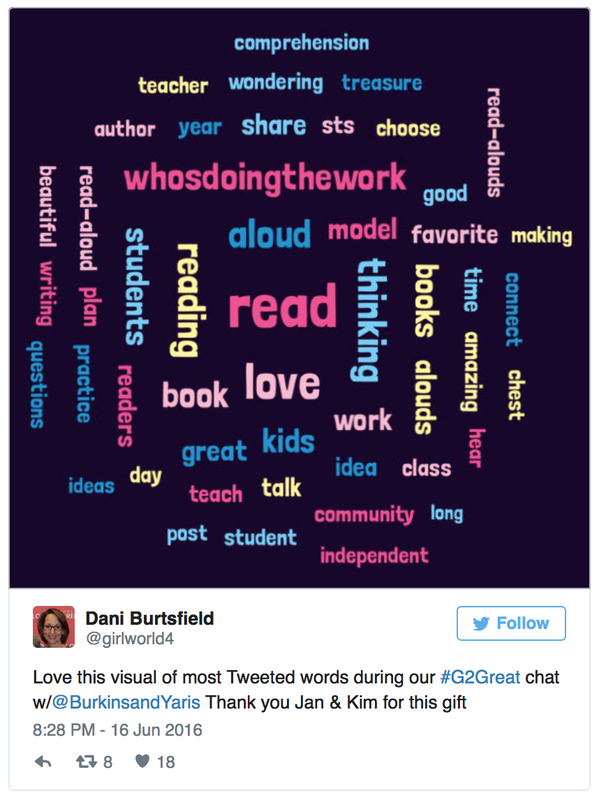 Over 1700 tweets and trending on Twitter within minutes and enthusiastic read-aloud suggestions reflected that our #G2Great chatters were ready to make this shift with gusto. We cannot even begin to become next generation read-aloud teachers until we make a time commitment to daily read-aloud. In my Steven Layne blog post, a comment was posted by a teacher describing herself as a read-aloud ‘thief in the night:’ “We have a specific district level mandate that reading aloud to the whole class for more than a few minutes/day is strictly forbidden.” Next generation read-aloud teachers hold tight to read aloud by carving it into daily schedule stone and they let nothing stand in the way – not even ill-informed absurd district mandates. Within this time commitment, next generation read-aloud teachers celebrate book choice as the inspiration. They thoughtfully select texts, opting for the highest quality varied selections that will cognitively and emotionally connect students in ways that give them a reason to actively engage in deep thinking. 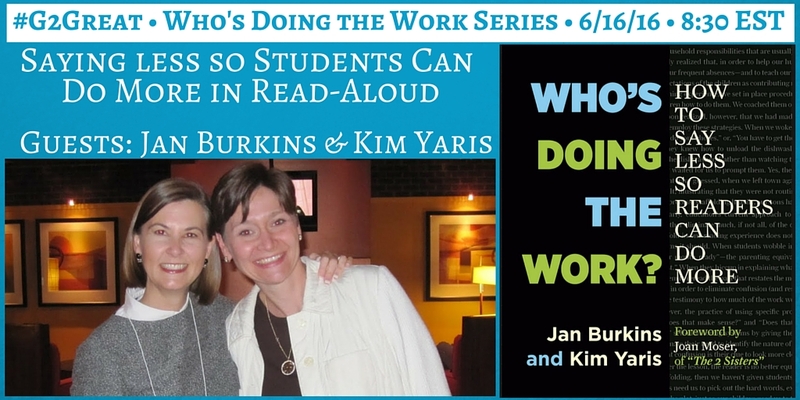 Jan and Kim remind us, “Text selection is the first, and potentially the most important, aspect of planning a successful read-aloud experience.” Next generation read-aloud teachers take this challenge seriously, knowing that texts are the spark that can touch the minds and hearts of students and beckon them to do more of the work. 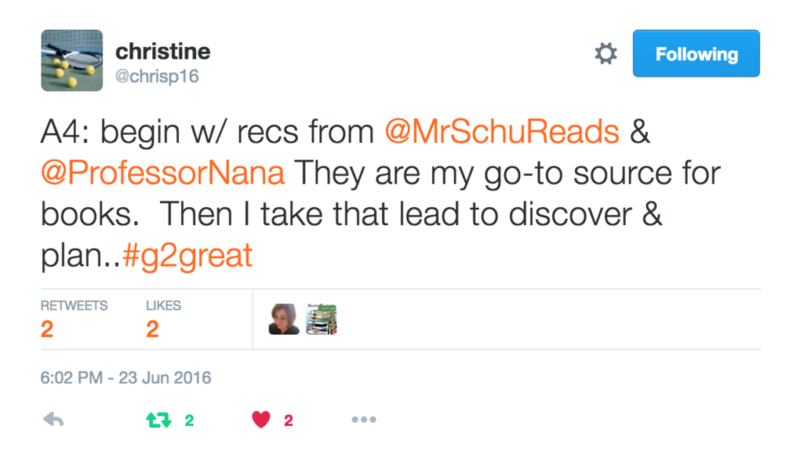 While book choice is critical, next generation read-aloud teachers also know that it is the delivery that can bring that book to life. One does not need to sit through many scripted read-alouds to recognize that JOY is the heartbeat of the read-aloud experience. Cautiously chosen and joyfully delivered texts can impact readers in substantial ways as we celebrate the beauty of the language, meaning, and pictures. 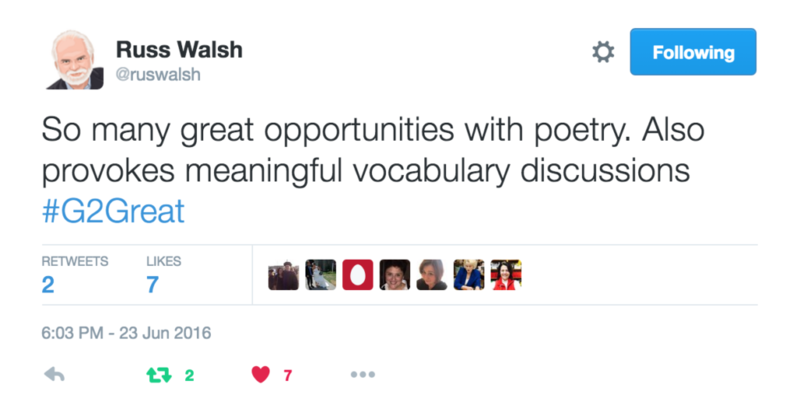 When we take time to linger a bit longer in engaging texts, we merge our collective joy and collaboratively savor words, images and messages in delight. Commitment, texts and joy form the foundation for next generation read-aloud teachers but they also recognize the value of well-planned instruction and refuse to leave this to chance. Planning is thoughtfully intentional so that they can make the most of every experience. They know books inside out before reading, carefully but selectively placing sticky notes at key points in the text that will afford opportunities to model, pause, reflect, and discuss. They have a clear purpose in mind and know how to breathe life into that purpose in organic and productive ways that will elevate the instructional goal without diminishing enthusiastic engagement. Of course, they have equal respect for providing opportunities to read-aloud for the sheer sake and joy of read-aloud. Next generation read aloud teachers respect the planning process, but they have even more respect for students. They are mindful that instructional goals can pull students into the experience or push them out, carefully balancing those goals by keeping students at the forefront. They are willing to ignore sticky note pauses or selected teaching points so that student thinking can rise to the surface. They invite deep thinking by encouraging student voices to lift above their own, viewing turn and talk as a read-aloud staple. 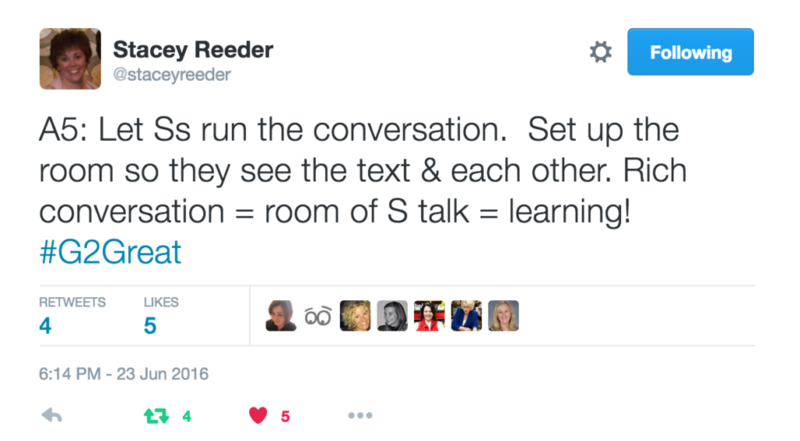 They celebrate the ideas readers bring to the read-aloud experience and use them to inform next steps. Each of the essential qualities described thus far are crucial but next generation read-aloud teachers recognize that read-aloud begins and ends with our students in mind. They view kidwatching as an art and use student conversations and reactions in the course of the experience to inspire noticings and wonderings that can elevate heat of learning moments. 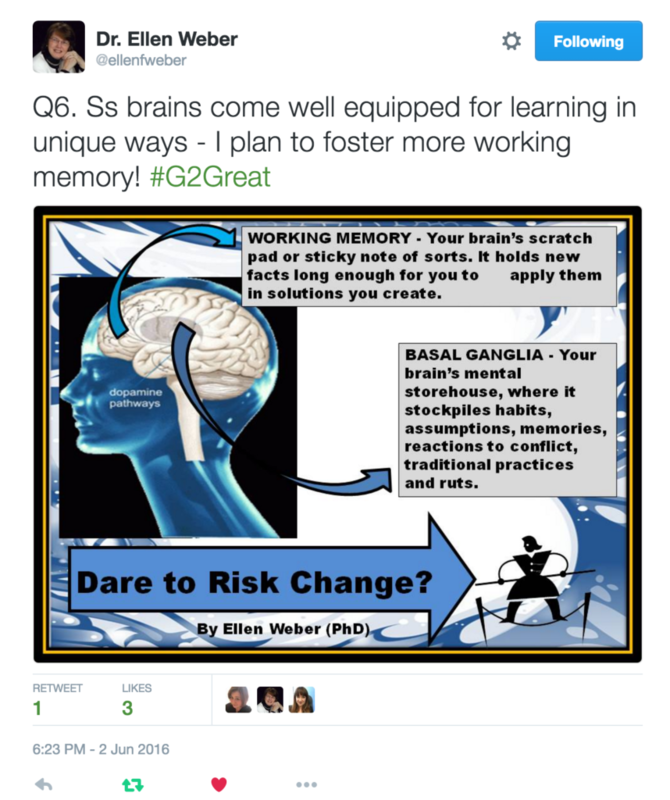 They seek to understand and use student thinking as a stepping stone to know students at deeper levels. They take advantage of powerful learning to make adjustments on the run to quench their curiosity with actions that are continuously informed by students. 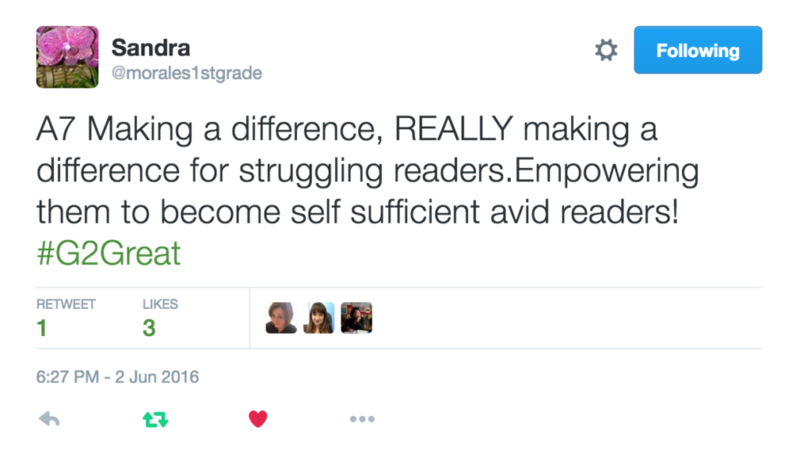 Finally, next generation read-aloud teachers are willing to courageously forge new paths to elevate the read-aloud experience. They offer students a steady diet of beautiful texts and strive to bring books and children together on a daily basis. They set the stage to help students understand how books work by designing a learning experience that will be both productive and pleasurable. Above all, they believe in students enough to turn over the reign of responsibility and trust them to do work they know may be messy. They embrace the mess, unfettered by the unknown while encouraging and supporting productive effort along the way. They accept this uncertainty bravely, knowing payoff will be immeasurable in terms of benefit to students – and that knowledge takes priority over all else. Contact Jan: jan@burkinsandyaris.com Contact Kim: kim@burkinsandyaris.com. People, places and perspectives. Within our school systems there are so many different people; the students, the teachers, the parents, the administrators and other members of the community. These stakeholders each come from different places with different perspectives but the one stakeholder closest to the learning and arguably our most important is the student. 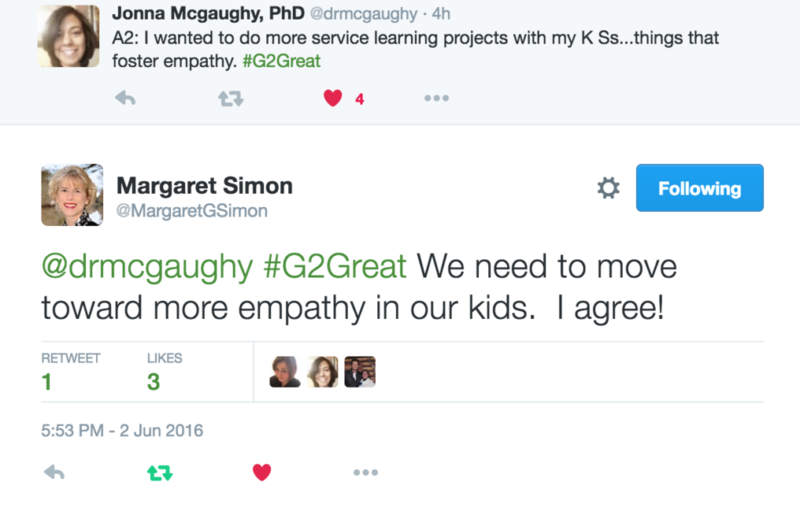 On 6/9/16 #G2Great we flipped our perspective and brought in an expert. The expert in this case, is a student with the perspective that should always be the first we consider in teaching and learning. 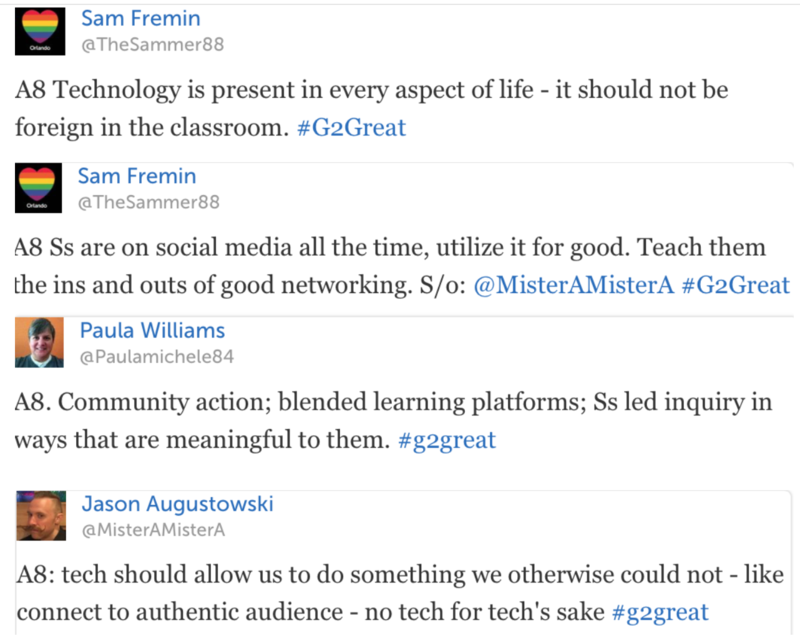 To bring this perspective we were honored to have guest host, Sam Fremin, or as he is known in the Twittersphere @TheSammer88. 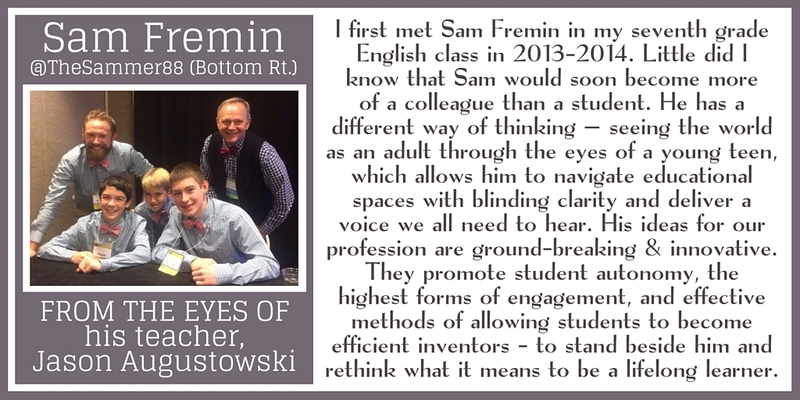 Sam is a 9th grade student who is a two time panel presenter at NCTE and an inspiring young man who helped us to shift our perspective for a different view on our instructional practices. 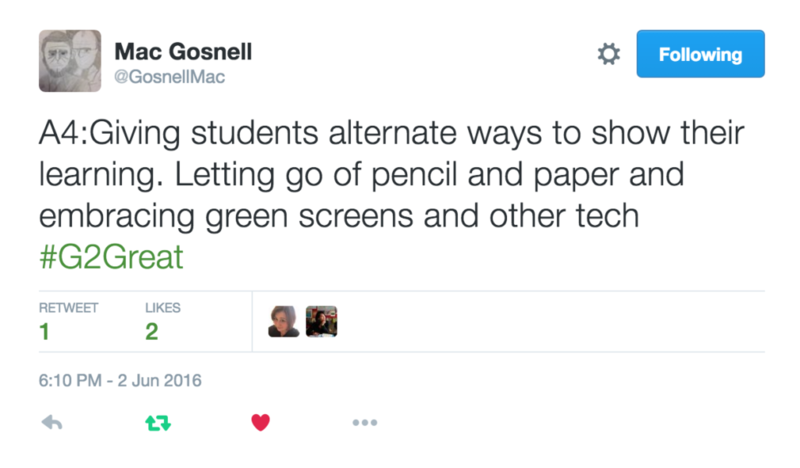 Throughout our chat, Sam helped us re-envision eight essential instructional points that will allow us to make this shift. When we slow down and shift our perspective we can begin to view teaching from a student’s lens. 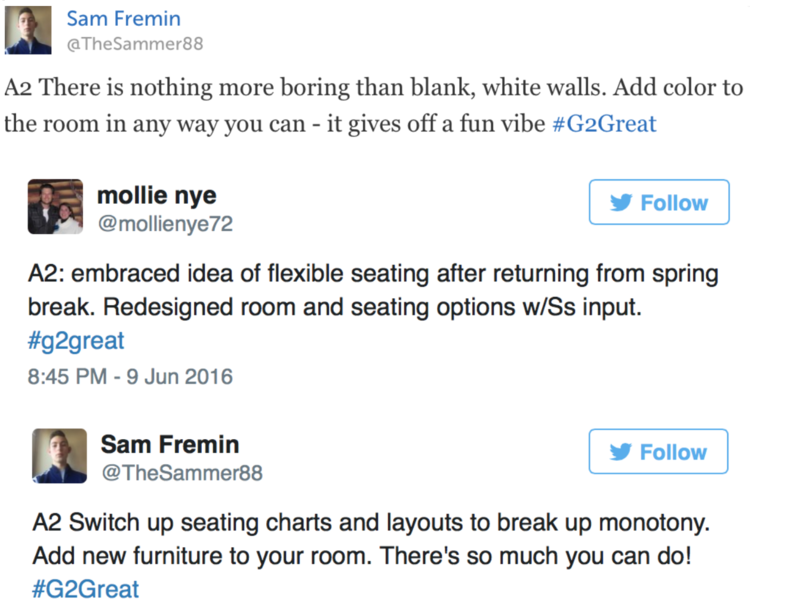 Reflection around Sam’s tweets allow for a thoughtful change in perspective and allow for the possible revision of our own thinking. As we re-envision motivation Jessie Miller reminds us of something that seems so simple and obvious: if we ask and listen, students will tell us what motivates them. Sam guides us to remember that as social creatures we crave the story. We can facilitate motivation when we listen to students tell their stories. Create a safe supportive learning environment where children feel safe to take the risks that are necessary in learning. 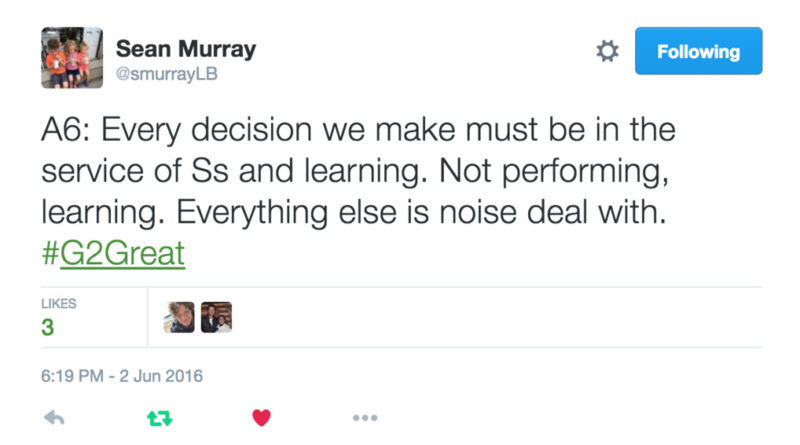 This statement is one that was the foundation of much of my learning as I prepared to become a teacher. When students are at the center of the classroom, they experience comfort and ownership that will enhance their learning experience. Allowing for flexibility along with input from students will help to ensure that students are in a learning environment that will best support their learning. As we begin to think about classroom design over the summer months, we need to consider the perspective of our students and plan for ways to engage them in the process of creating their learning environment. How will you plan for ways to involve your students in co-creating the classroom environment when they begin the new school year? 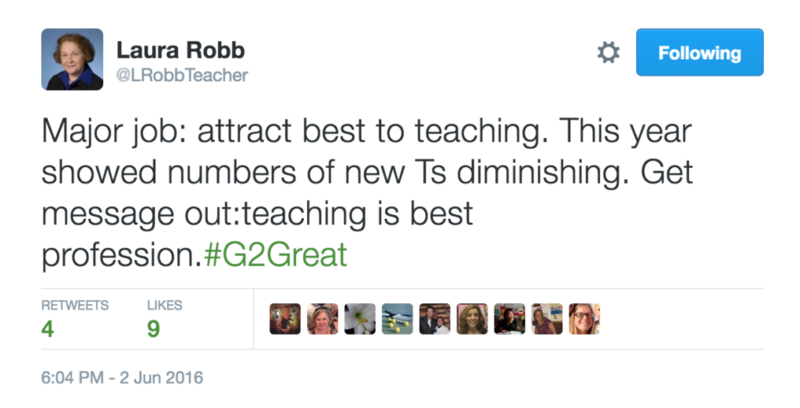 You will want to think about this from the perspective of your students as you begin a new school year. The flexibility that comes with differentiation of instruction creates so many opportunities for educators to consider in planning. 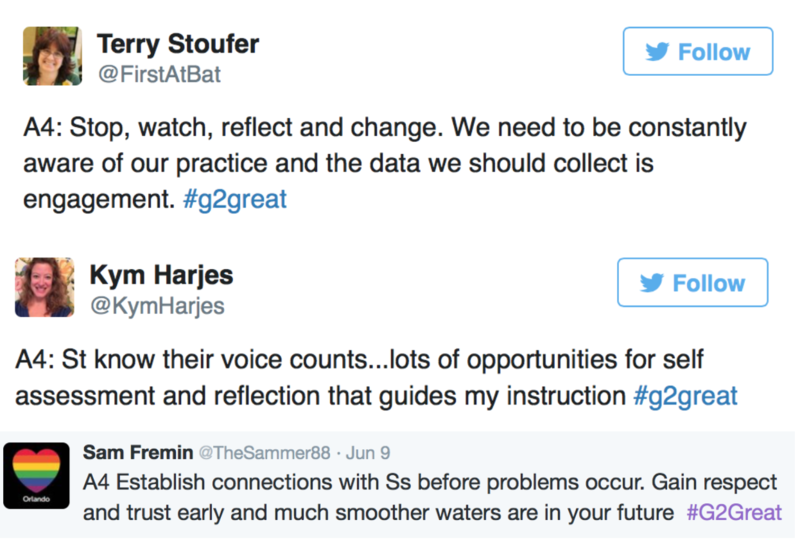 These tweets below show us that we need to embrace reflection and change in order to best meet the needs of the learners who are the source of our planning. 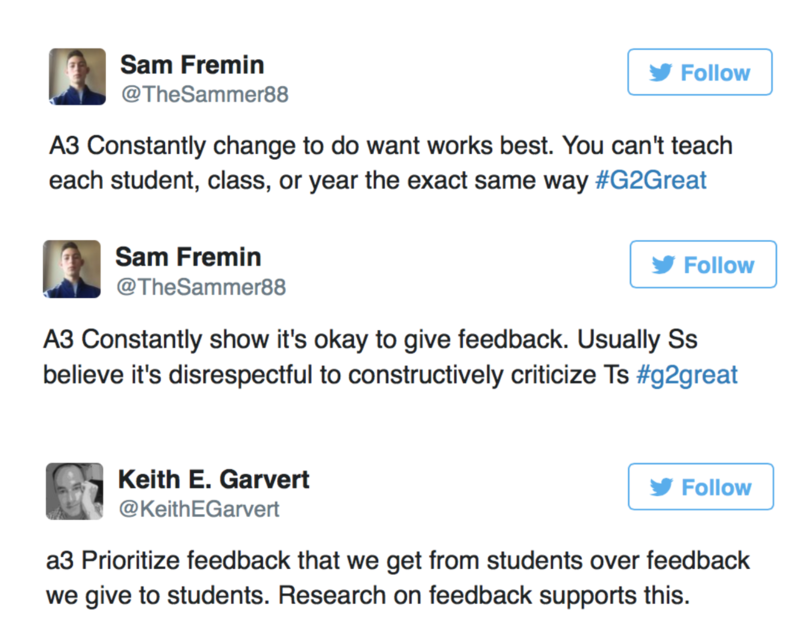 Being open to feedback from your students provides the perspective of the learner and allows us to plan for true differentiation in learning. 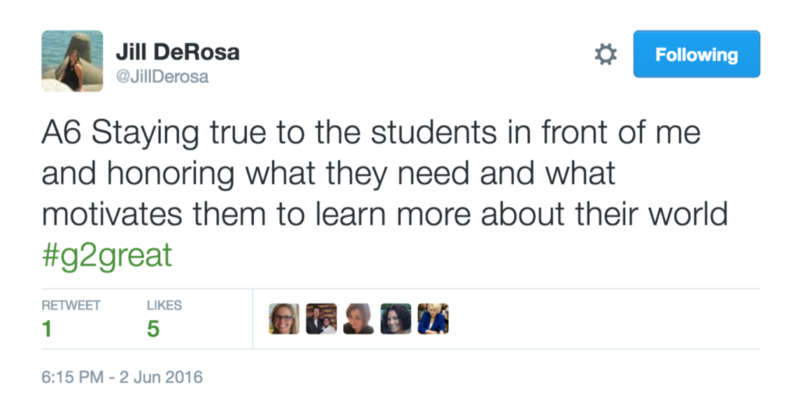 True student engagement is not usually questioned because we know it when we see it. There is a certain buzz about the room when we see students authentically cognitively engaged. Engagement can be the doorway to a student’s learning as well as the constant vehicle that brings students along on the road to learning. 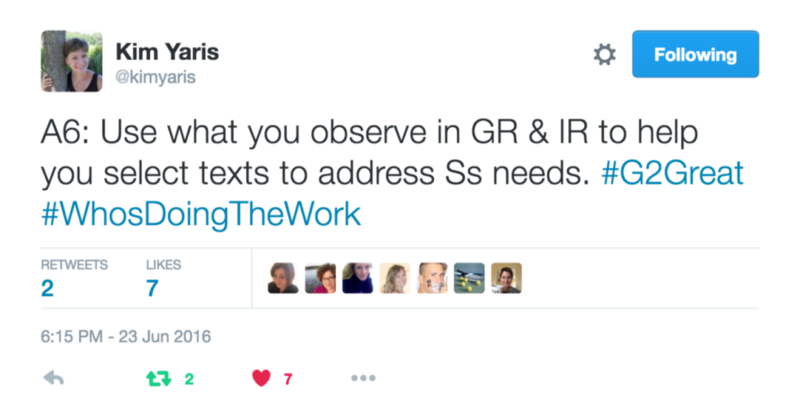 Monitoring engagement provides a way for teachers to collect and analyze data. Using this data provides the rationale for changing our plans or simply put, being a responsive teacher. Collaboration is perhaps one of the most widely desired skills that employers are seeking for their future workforce. 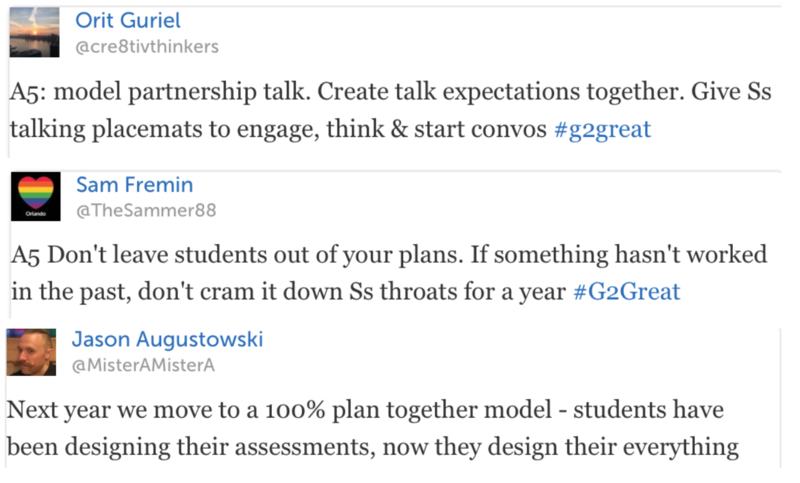 Modeling for students just how collaboration works is one way that students learn how to effectively collaborate. The partnership work that begins early in our reading and writing workshop are perfect “labsites” for students to practice skills and get feedback from peers as well as the teacher. Expanding from partnerships to book clubs and then some larger groups offers the opportunity to build on this skill for college. 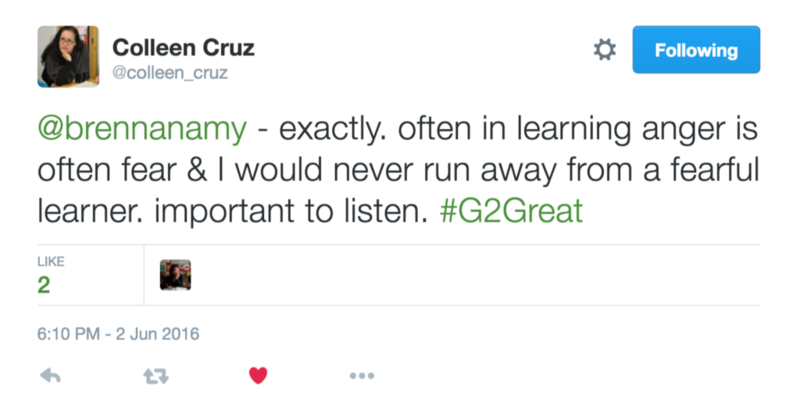 Jason, one of Sam’s teachers (@MisterAMisterA) emphasized that he was working on a 100% plan together phase. Students create not only their assessments but their curriculum. Transfer of learning is our goal in the learning process. We want students who have learned in one context to be able to transfer that learning and apply it in a different setting. 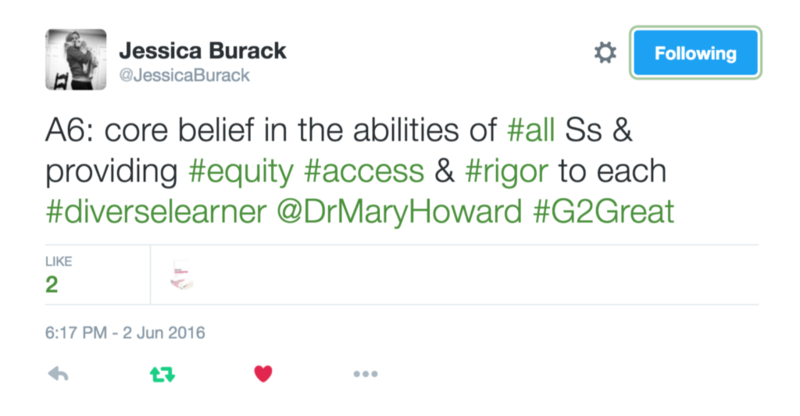 When our students are able to transfer, it is only then that we know learning has stuck. 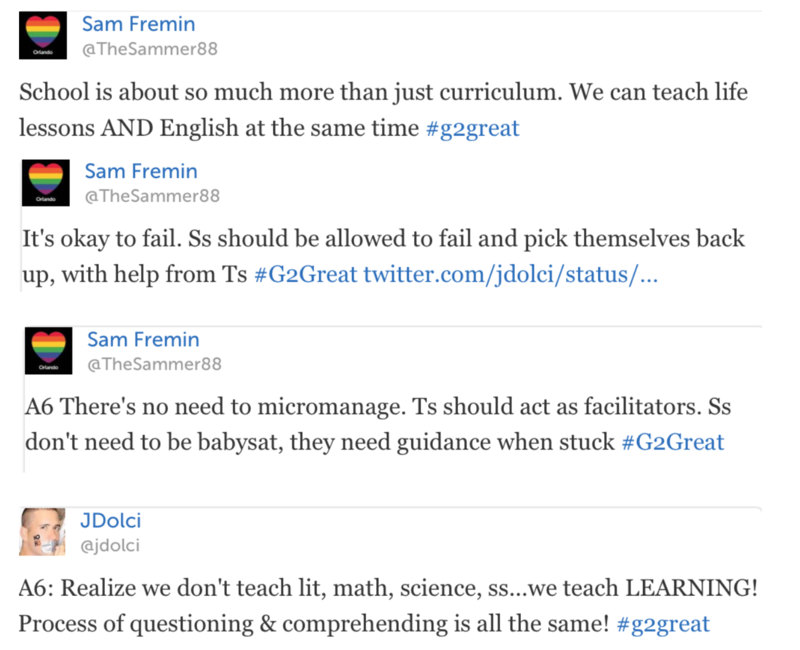 During the chat as Sam shared his perspective on transfer and reminded us that school is more than just curriculum, Justin (@jdolci) shared that we are not just teaching isolated subjects, we are teaching learning. When we apply a student lens to transfer we can see the importance of teachers acting as facilitators to support those opportunities for transfer. In the end, we want our students to take what they have learned in our school environment and transfer it to solving real world problems. The thinking skills we teach in literacy will serve our students well as adults, and this happens when we teach for transfer. Homework is big topic for debate in recent years. Parents, administrators and teachers have their perspectives and during our chat Sam shed light on the issue of homework from the eyes of a student. 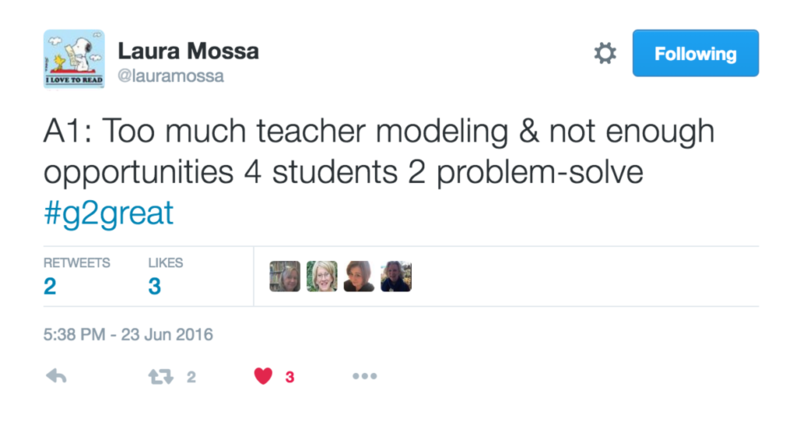 Sam reminds us that students need to understand the rationale behind homework. 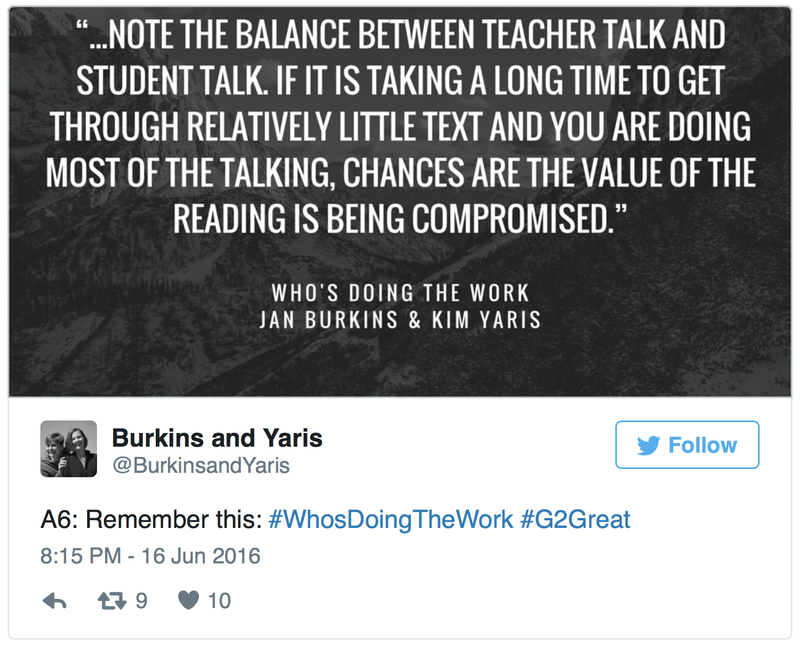 Our students know when homework assignments are not purposeful. Sam’s choice of the word disheartened in the tweet below should call us to attention and remind us that students need to know the rationale behind homework assignments. We have to ask ourselves if there is a rationale for the work, can we we explain it to our students. Sam’s words remind us that no student should feel disheartened ever about homework. 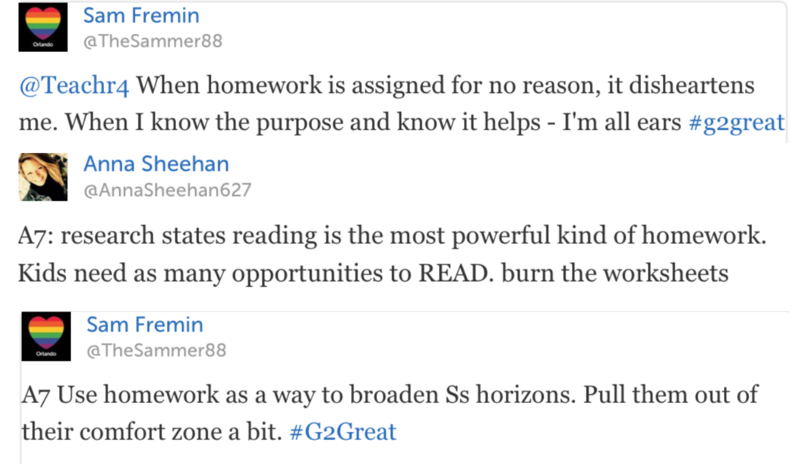 Sam’s suggestion about using homework as a way to “broaden” our students’ horizons is a piece of advice well worth listening to and implementing. 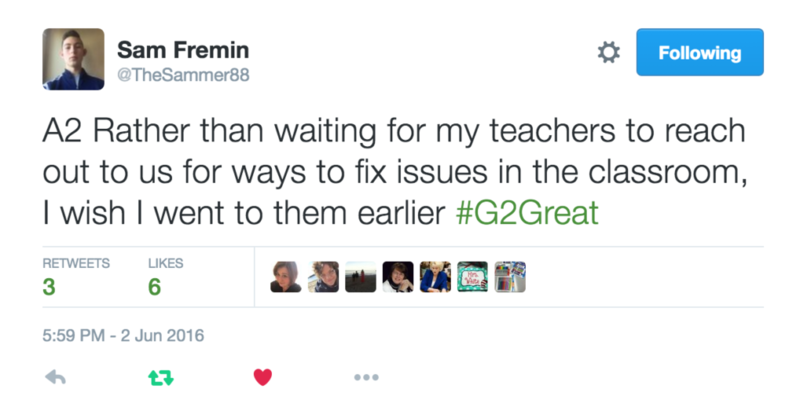 Students like Sam are in a great position to offer their perspective to educators. Looking through the lens of a student in this area shows us how important it is to stay current and use technology to enhance instruction in the same way it is used in the world. If technology is present in every aspect of life as Sam points out, then so should it be in schools where students are being prepared to enter college and careers. People, places and perspectives. Our school systems are built from people from different places all with different perspectives. If we believe in the strength of the many people within our instructional setting, the different places they’ve come from and the unique perspective each person brings to the learning experience, we will discover the immense power in our school system. As we embrace people, places and perspectives, we build bridges that will shift our lens to varied viewpoints and catapult collective learning. 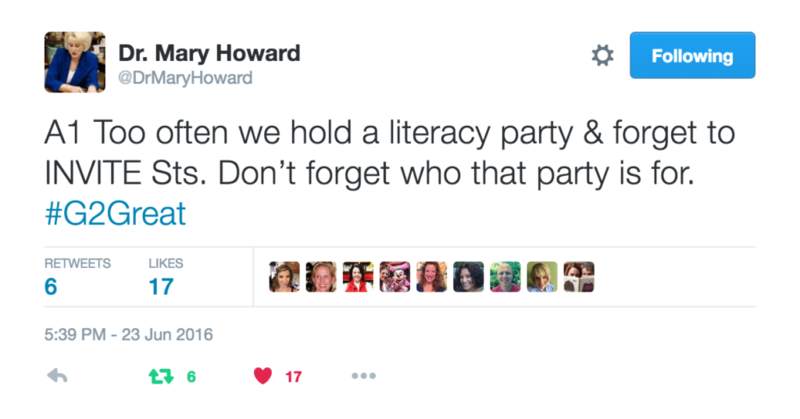 That is where there is true power — collective learning. 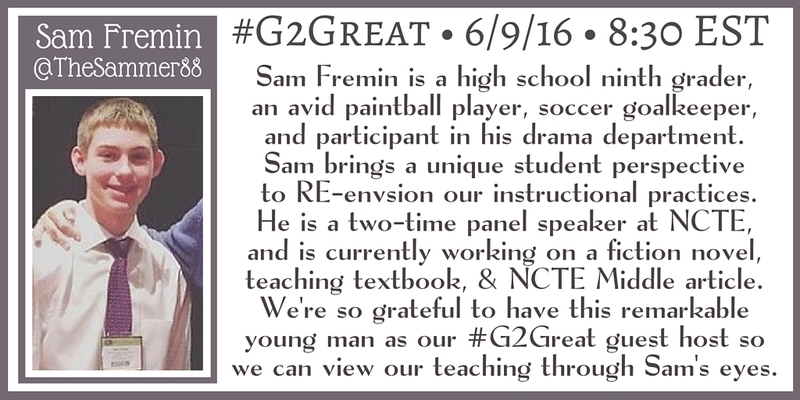 We are all grateful Sam allowed us to re-envision our teaching through his eyes as we look ahead to a new year. Teachers are getting ready to close our classrooms for summer, and begin to open our minds for deep reflection, and planning for future goals. 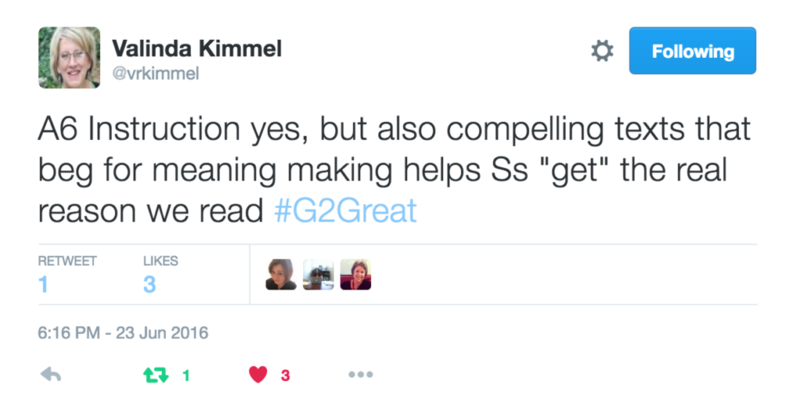 On June 2, 2016 #G2Great asked teachers everywhere to ponder their practices more closely: Looking Back on 2015 2016:Reflecting on the Past to Enhance Our Future. As I consider my personal impact during the school year, some nagging questions begin to cycle through my thoughts: Did I do enough? What could I have done differently? If only I had a little more time, maybe I could get to that next thing – whatever that thing may be. Can you relate? If you can, I feel as though a good story might help put our hearts and minds at ease. Dottie Hayhurst is a petite efficient woman who has a knack for making things grow. Each year she works with diligence to plant her tulip bulbs in the fall. With deft determination she nimbly digs deep holes and places each bulb with great care. She considers many things: Will the colors compliment each other? How far apart should the bulbs be? Where will they get the best light? How should they be arranged so that they enhance the flagpole, the driveway, the walkway? Then she tucks them soundly into the ground, she tends to the soil, and finally she lets time do its job. By the spring her garden is just lovely. Joyful growth colors the world to celebrate spring. Dottie’s garden offers up tulips to the world as a beautiful tribute to her dedication over time. She makes the world better one tulip at a time. A garden needs time and constant care. 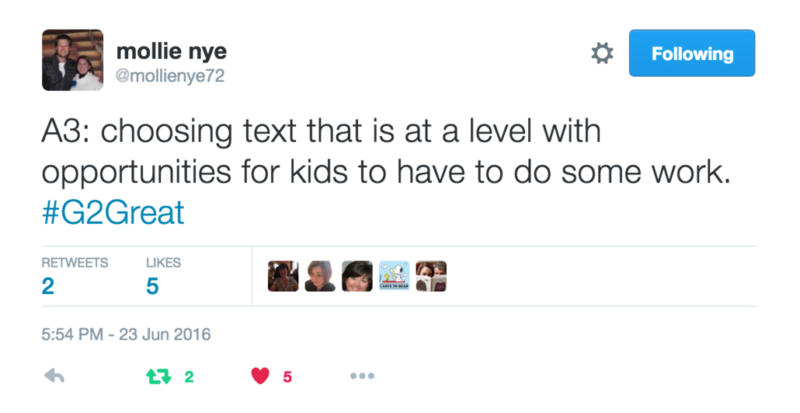 This is also true for teaching. Honing our craft is a slow and steady process of reflection and goal setting. 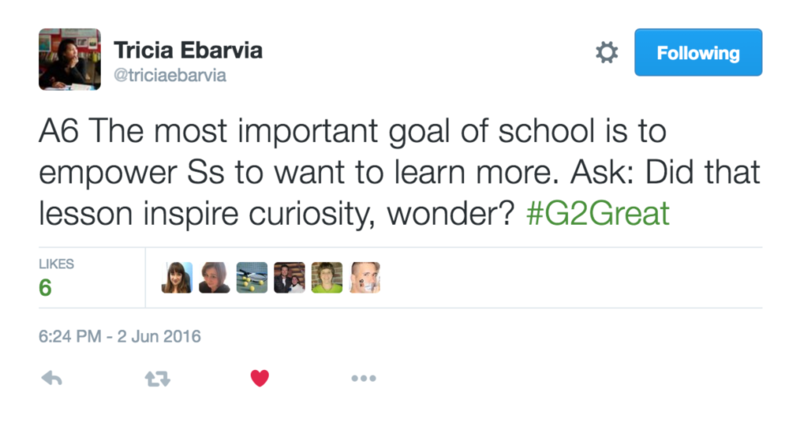 There are days when students’ learning seems invisible to us. Having a vision paired with professional experience helps us understand that growth is happening below the surface. No matter how committed we are to student growth, for many children that growth happens on its own clock. 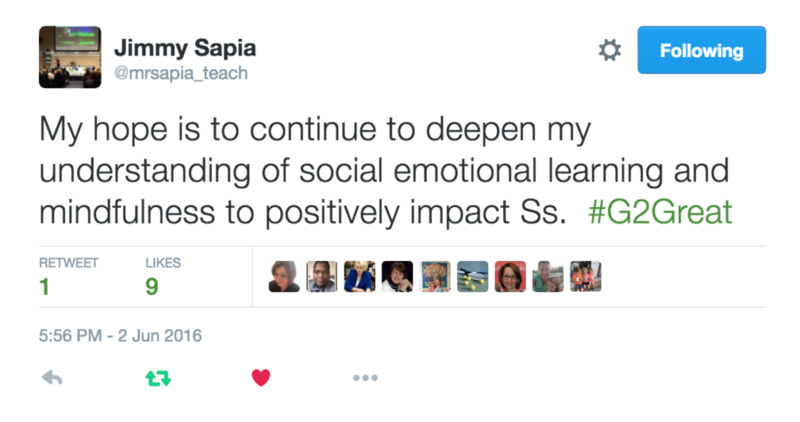 Our impact can have an opposite effect too. 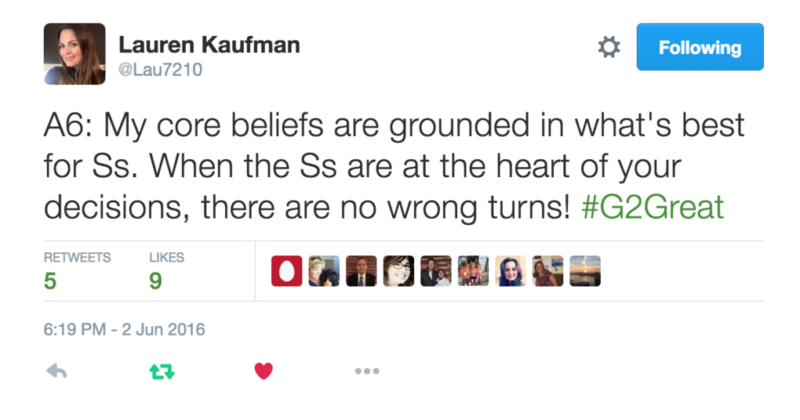 We can set children back, not even realizing what we’ve done if we’re not reflective. We must reconcile the challenges of our own practice and the time and development of children. Our response to that truth is to be fully present and mindful, to find ways to measure growth. 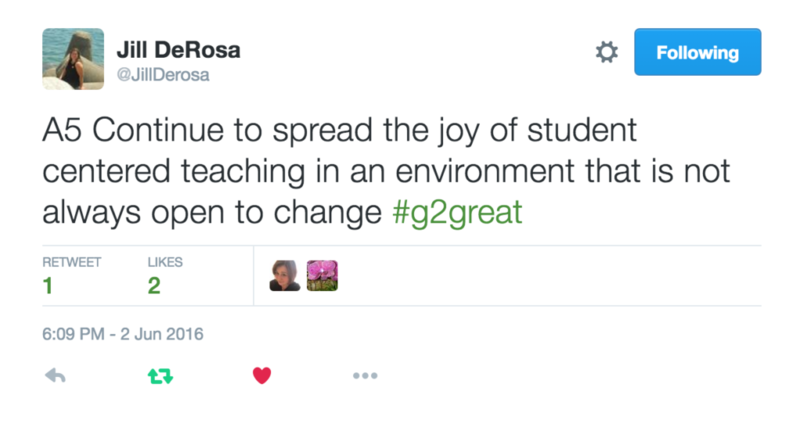 Let’s celebrate the idea that students are always becoming. Especially when they do not have the self-awareness to know this for themselves yet. 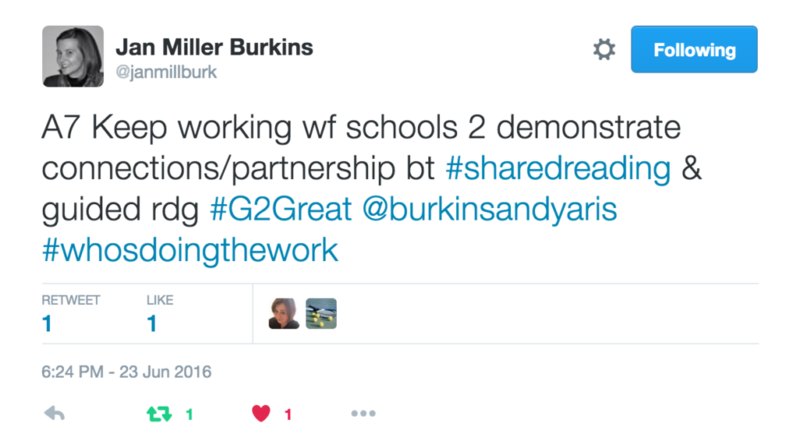 Make a promise to show them all the great work they have done and will do based on all the great work they’re doing now. 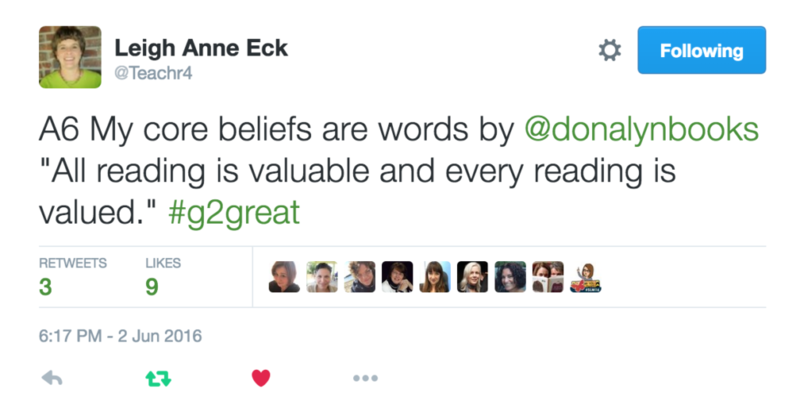 When we have an unwavering belief in students we are giving them what they really the most. 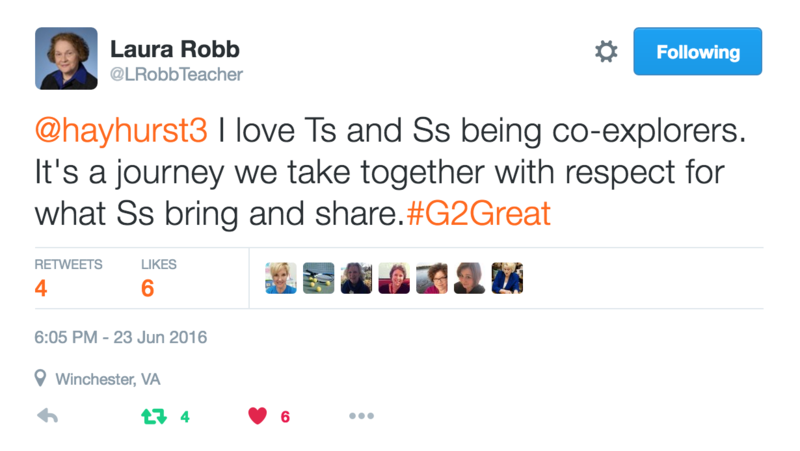 How did I make my students feel about themselves? What evidence do I have that shows I made a positive impact on their lives? What do I know about this child as a learner?